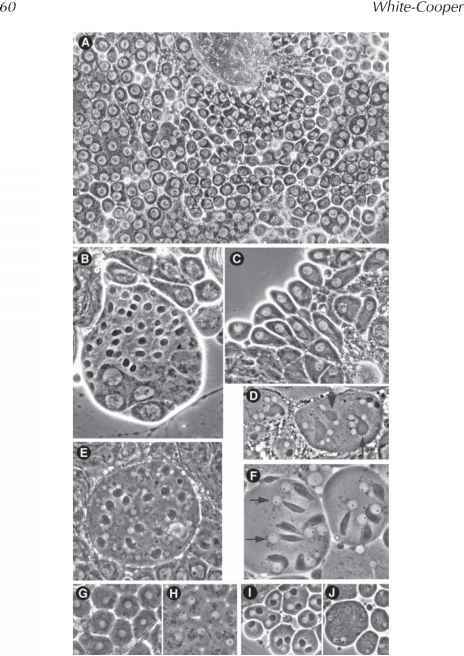 Since its development by Pardue and Gall (1), the technique of in situ hybridization to polytene chromosomes has played a central role in the molecular genetic analysis of Drosophila melanogaster. The power of in situ hybridization is largely the result of the scale of polytene chromosomes and, consequently, the high degree of resolution they offer the researcher. The use of radiolabeled probes has now been largely superseded by faster, nonradioactive signal detection methods, generally using biotin- or digoxygenin-substituted probes that also offer greater resolution, because there is less scatter of signal with immunochemical and immunofluorescent detection than with silver grains. The utilization of in situ hybridization technology is of particular interest to those engaged in chromosome walking or genome mapping projects, in which it is essential to check all clones along a chromosome walk by in situ hybridization in order to identify clones containing repetitive DNA and to avoid the isolation of clones derived from outside the region of interest. It is also useful when orienting a chromosome walk and when determining if a particular clone is derived from DNA uncovered by a deficiency. At least one Drosophila genome mapping project (2,3) relied on in situ hybridization to accurately map sets of overlapping cosmids (contigs) to the polytene chromosome map, whereas another (4) used in situ hybridization as the sole means of ordering yeast artificial chromosome (YAC) clones along the genome. chromosome rearrangement breakpoints and work involving related Drosophila species. In this chapter, the use of biotin-labeled probes for in situ hybridization to polytene chromosomes is described.